Many have heard the tale of Gideon and his army of 300. Gideon believed God was so specific in choosing the 300, the ones that cut down the armies of Midian from 135,000 to 15,000, that he believed they were to complete the task of wiping this enemy off the face of the earth. You see, at some point, when it was obvious the Midianites were going to lose, their two kings fled home with 15,000 men. Gideon desiring Israel to be free from her enemies decided to pursue them and finish the job. What does this have to do with briers you ask? Well, after the wildly creative first battle, the men lay down their hammers and torches and picked up swords. They started the chase. There was only one problem, they were exhausted and hungry. They were faint, and yet pursuing, much fatigued with what they had done, and yet eager to do more against the enemies of their country. Our spiritual warfare must thus be prosecuted with what strength we have, though we have but little; it is many a time the true Christian’s case, fainting and yet pursuing. Continuing our story, the 300 were faint. Gideon stopped in the city of Succoth, one of the cities they were trying to save from the Midianites, and humbly asked for bread for he and his men. Men of the city ridiculed Gideon and basically called him a liar and a weenie. Gideon looked at them and paraphrasing here: "I don't have time to deal with you right now, but when I come back with proof, as in two kings, I'm gonna whip you!" 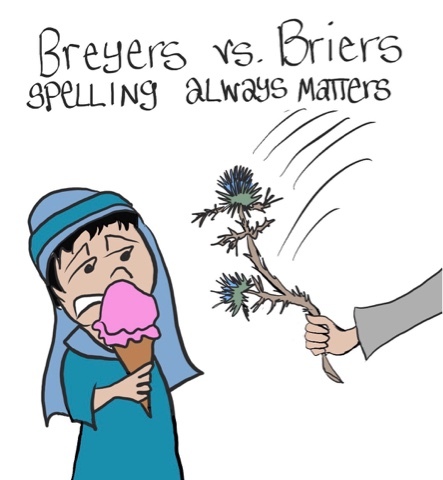 Maybe the men of Succoth thought Gideon said "Breyers" the ice cream not "briers" the thorny whipping bush. Gideon kept his promise. After defeating the two kings and the 15,000-man army, he turned back toward the city of Succoth. Along the way he and his men caught & interrogated a young man of the city that gave the names of every leader and where they lived. Whoa! Gideon, does not mess around! Gideon gathers the leaders and presents the two kings to them. The ones they said he couldn't defeat. He kept that half of the promise and he kept the second half as well. The Bible says that he "taught" them. Many sources believe, the men of the city were not whipped with the briers.... they were rolled in them. Ouch! 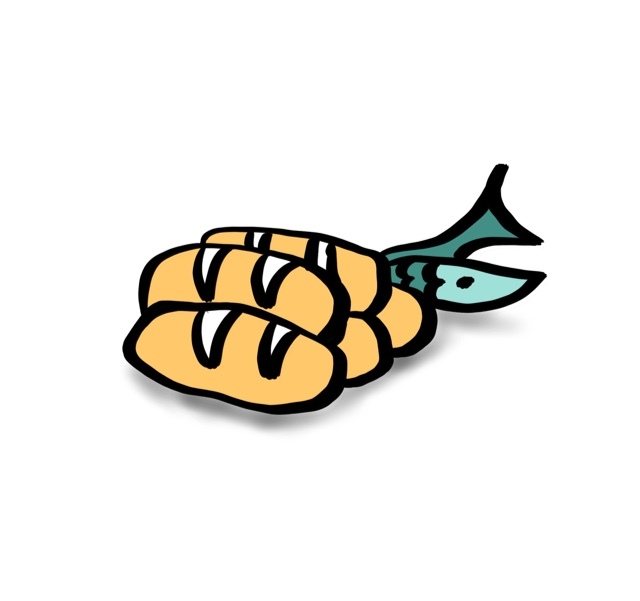 It seems that the difference between thorns and briers is the thorns are more spaced out and individual spines. Briers are dense spiky clusters. 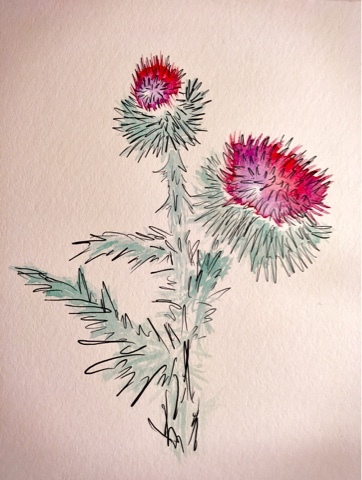 Think of the purplish thistles we see here in North American fields. Israeli briers are no joke. Its scientific name is Echinops viscosus. Even its common name sounds grumpy: Viscous globe-thistle. I think it sounds like an medieval put down: "you, villainous viscous globe-thistle!!!" They look like plants that may have inspired some of the illustrations of Dr. Seuss. The are characterized by the spiky blue globe flower head set atop of a tall spiny stalk, but on top of all that they are sticky. So these sharp things are sticky. Briers that do not just brush off, you have to be intentional in getting rid of them. Exhausting! 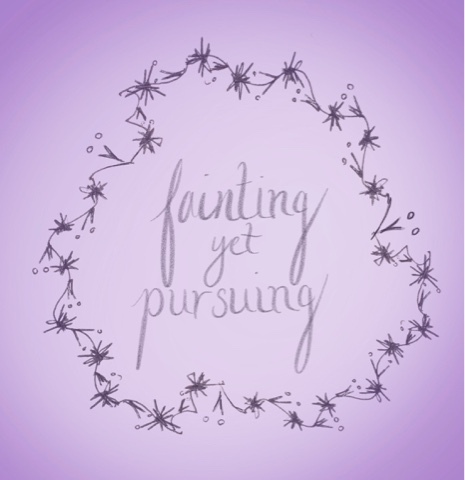 I think most times we find ourselves in the camp of the 300: fainting, yet pursuing. But there are those unfortunate times where our snotty responses escape. If we would take the time, we could spare ourselves a vicious beating if we would forgive and make amends immediately. Make your words sweet or you may have to roll in them. Barley was one of the earliest domesticated crops in the world. Making it one of the most prevalent because it is still used today. 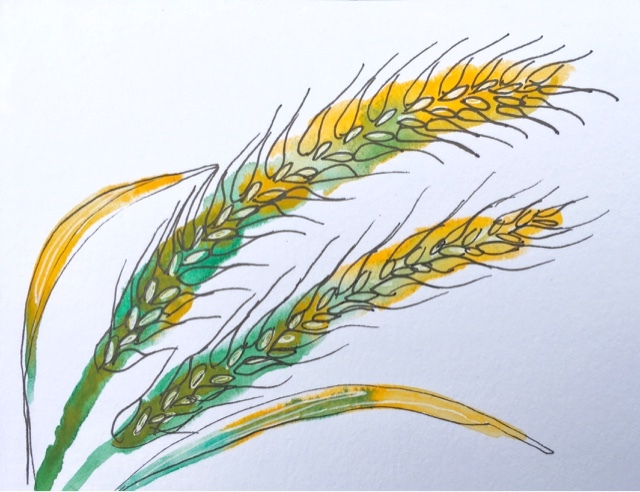 It has and always can be found in soups and in breads, but throughout the ages barley has had some very interesting occupations. 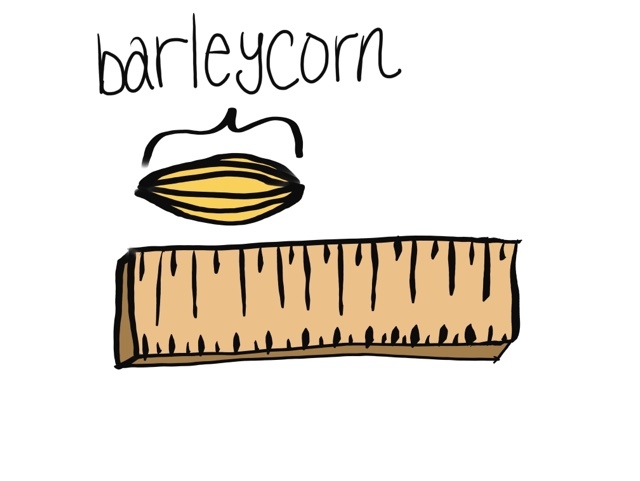 It was food for people and animals, it was even exchanged as currency, but today we're going to talk about a lesser known use of barley: measurement. 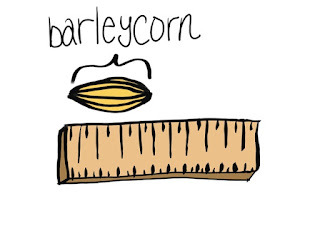 In ancient times, the length of a kernel of barley was used as a standardized measurement. "Cut me four barley lengths of string!" One barley kernel equated to about 1/3 of an inch. In fact, this was carried over into the middle ages in Ireland and Britain. 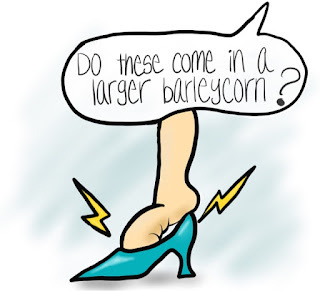 The "barleycorn" was used as a standardized measurement for shoe sizes. Some still use it today! Barley was also used to measure dates. The Jewish calendar is based around harvests. Barley was the first crop to ripen. Wheat usually followed 2 to 4 weeks afterward. So barley measured length and time, but let's get to the scriptural application. There is no greater book in the Bible that gives tribute to barley than the book of Ruth. Naomi and Ruth arrive back in Naomi's hometown just in time for the barley harvest. I love how this book testifies to the glory that is God's timing. It just so happens that one of Naomi's relatives, Boaz, owned a barley field. It set into motion almost to perfection the law of the concept of kinsman redeemer. It was believed in Jewish culture that if the lineage of a man's name were to be wiped out due to his death without a child that the closest living relative would redeem his name by marrying the widow. Naomi knew of all of this, but almost didn't dare to hope. She knew her relative would be kind to her. 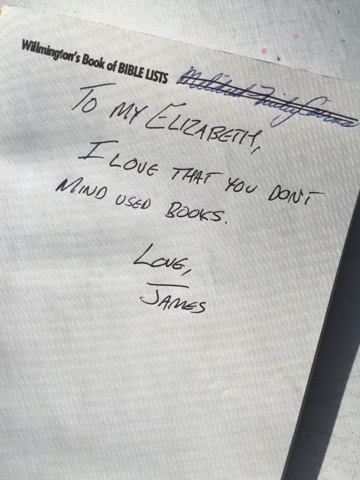 But as you read the story, you see his generosity exceeded what was required of him. When Naomi noticed the favor he showed Ruth, she instructed her in precise steps to secure a future for them both. Ruth did everything Naomi asked of her. I love Boaz's response at finding Ruth at his feet. Even though he had been the one that was too generous letting her glean, he says to her that she is the too generous one that would look upon him as a companion. Beautiful! He is so pleasantly surprised, but then he remembers there is one relative that is closer. He must see what his response is first. He tells Ruth to wait there. So she lays back down at his feet. Do you think he slept that night? In the morning, he is about to send Ruth back to Naomi when asked her to bring her shawl over. He filled it with 6 ephahs of barley. There is some debate of how much this was. If you go by the standard weight of an ephah, Boaz would have laid 200lbs of barley on Ruth. There's no way girlfriend could have lugged that back to town on her own. It is much more likely that it was 50lbs of barley which is still quite the load, but manageable. I would like to present to you that not only was barley used to measure length and time, but also affection. You can almost hear Naomi laughing out loud while she says, "the man will not rest" till he knows if you are to be his. The size of the gift that Boaz bestowed upon Ruth made it obvious to Naomi that if it was within his power Boaz was going to redeem Ruth and Naomi. Their lives might even change by the end of the day. Proving, I feel, that love can be measured in barley as well. God, Himself, even prescribed the giving of barley as a sign of affection. In Leviticus Chapter 2, great detail is given to the definition of the Grain Offering. This was quite different from the animal sacrifice to cover sin. First off, burnt sacrifice was totally consumed by the fire, the grain offering was only partially given to the flame. The rest was for the priests to feed their families. Typically made of wheat or barley, the offering could be the grain itself or in little unleavened cakes. This was an offering of thanksgiving for God's mercy and His provision. The purpose of the grain offering was not atonement, but worship. How lovely that Boaz's gift was one of worship/adoration! Fast forward to a certain scene in Galilee. A whole lot of people forgot their lunch except for one little guy. This boy hands his whole meal over to the disciples. Is he really the only one who planned ahead? Little boys are tactical when it comes to knowing how long they will be out playing and how this usually needs to involve a snack. The stomach speaks! 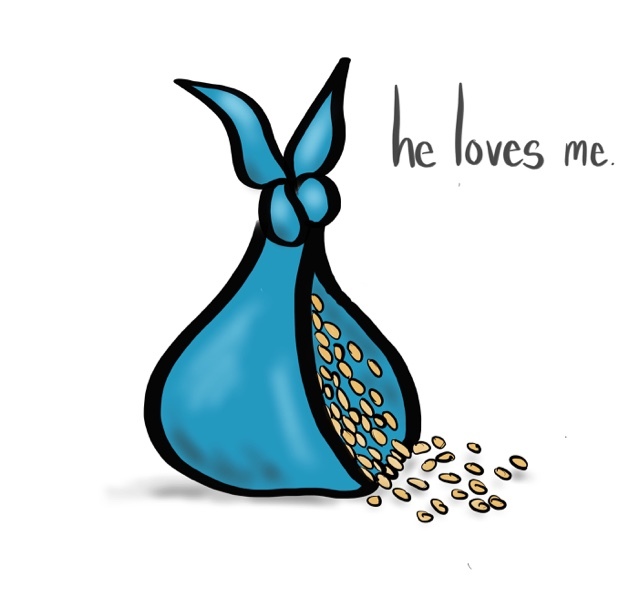 But he lovingly gave his barley loaves and fish to Jesus. His grain offering. His act of worship. And here Jesus, God in man, returned to the people a blessed multiplied offering of worship, adoration and provision. This brings me to my final point. It would not surprise me if many in the crowd that knew of the miracle of the feeding of the 5,000 might wonder, "if Jesus is in charge, will we have to work for food?" This would drastically change the economy of the world. Free food? At least twice more in the scripture, barley is also used to measure the state of the economy. You see, the city was under siege by the Syrians. Prices on food had gone way way up! People thought they were going to die. The Lord told Elisha things were about to change. Sure enough, two lepers decided they were probably going to die either way so they went to the Syrian camp. It was empty. What!? The Syrians got spooked and left everything. Everything! So the city plundered the encampment and prices changed over night! The economy was measured in the price of barley. Matthew Henry's commentary suggests that the famine will not only be of literal bread, but of spiritual bread. Barley! You are jam packed! We find barley to measure length, time, love, worship & the state of the economy. I can barley take it all in!! Anise plays an unusual part in the Scripture. 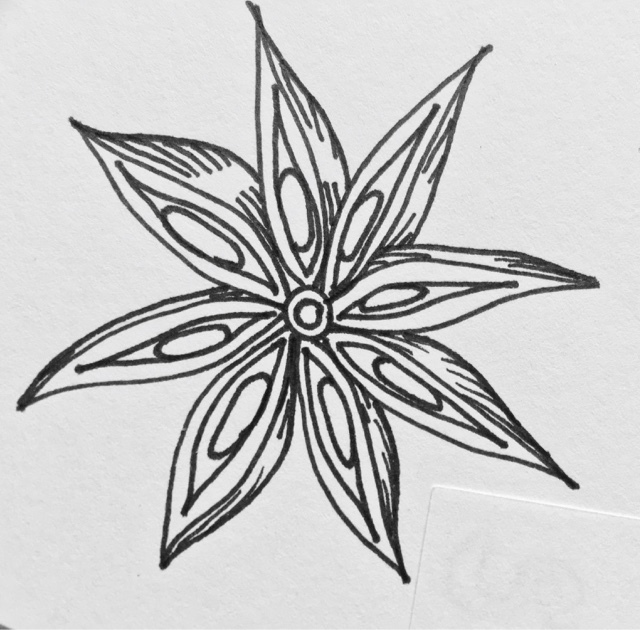 Most often in modern times we see its familiar star shape in potpourris because it adds visual interest, but in Biblical times anise was used to treat indigestion and other internal needs. The Romans would make cakes with anise in them for the end of a gluttonous feast to reduce the consequences of taking in a lot of rich food. One of the most surprising uses for anise, of which our scripture reference alludes to, is that it was used as currency. People would pay in anise for goods and services rendered. My loving husband chimed in here: “Aha! Money does grow on trees!” Well, it did in Jesus’s day and He had something to say about it. They paid their tithes with anise! That’s bananas! Well, it’s actually anise! That’s anise! Why would this be something that Jesus commented on? It’s pretty specific. Matthew Henry elaborates in his commentary that Jesus was saying that the Pharisees paid their normal tithe, but on top of it they paid with these herbs and seeds. 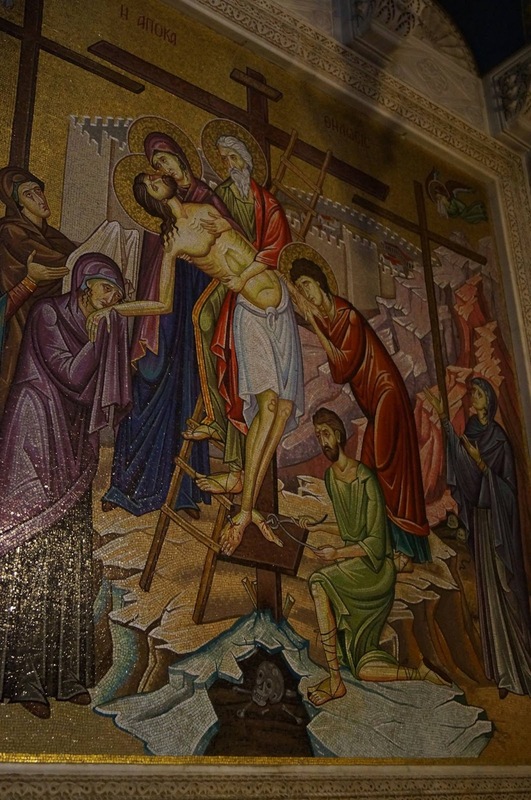 It wasn’t that they did this that bothered Jesus, it was their motive behind it. They did it to be seen. They did it to show off. “Look we tithe of everything we have even our plants tithe.” They did it to influence the priests and defraud the congregation. Why was it fraud? Because it basically cost them nothing to pluck it from their gardens and deposit it at the Temple. When King David faced a similar dilemma in 1 Chronicles 21:24, we see him basically saying I will not offer God anything that costs me nothing. Jesus wanted the scribes and Pharisees to continue keeping the law, but he did not want them to forsake the things that were most important to God. Like, “justice and mercy and faith.” The entire letter of the law is important to God, but some parts are weightier than others. These are the parts that deal with our internal beliefs, our self-denial, and our posture before God. The Pharisees were walking by people that were hurting and hungry everyday to deliver their tithes. Then they were condemning the people for not following the law like they did. Jesus always called out the hypocrites. To obey is better than sacrifice. Mercy is also preferred before sacrifice. 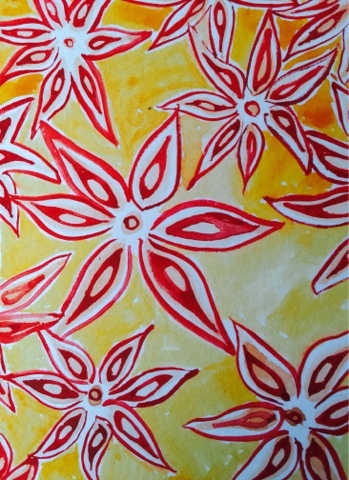 I want to examine my own heart and life and ask, “Have any of my ‘sacrifices’, my offerings to God, become anise? Are there things that I am offering that cost me nothing but I am using them to get me out of a true sacrifice? Have you any anise? 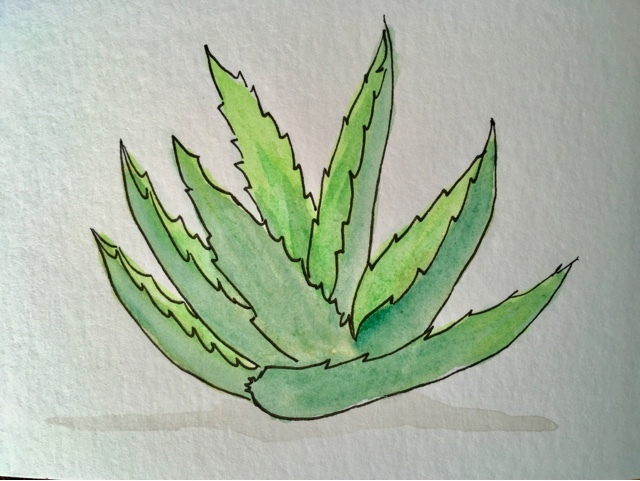 In biblical times, aloe was used for the purifying of the bodies of the dead (embalming) and for medicinal purposes. In Psalm 45:8, Matthew Henry’s commentary suggests that this messianic psalm says that the robes of the Messiah king are not necessarily praised for their looks, but they are praised for the fragrance they are soaked in and anointed with. How fascinating! There should come from this particular formula of perfume several striking points. First, some of this particular combo is found in the designer fragrance and anointing oil from God, Himself, that we find in Exodus 30. The specific recipe was only known to the priests, but it included myrrh, cinnamon, cassia, sweet smelling cane and olive oil. God describes how this anointing is to be used for consecration in verse 25. So, hold up a second! Lets break it down. The anointing oil God custom designed for His place of meeting with the Children of Israel is what the robes of the Messiah will be soaked in. I’d like to pause here to insert the scientific study of olifactory memory. Scientists have done extensive research into how certain smells can trigger responses in us of which we may have no longer have conscious memories. You probably have smells that you can think of that remind you of certain places or people. That’s how powerful smell is. Joseph and Nicodemus soaked the strips of linen in myrrh and aloe and then bound the body of Jesus with them. Remember Psalm 45:8! The psalm says the Messiah will be doused in it, but also with aloe. Why aloe? We see in John 19 when aloe was added to the scene by Joseph and Nicodemus. It is because of the ultimate act of love from Jesus laying down His life. It will never be forgotten. He will carry the fragrance of sacrifice with Him always. We will always remember His great love for us when we smell aloe and myrrh upon His robes. I wonder when He returns, will we smell Him before we see Him? I have really been wanting to get back into creating every day, but probably the hardest part about doing so is coming up with ideas of what to create. So I am going to be documenting my journey with one of my favorite Christmas presents. 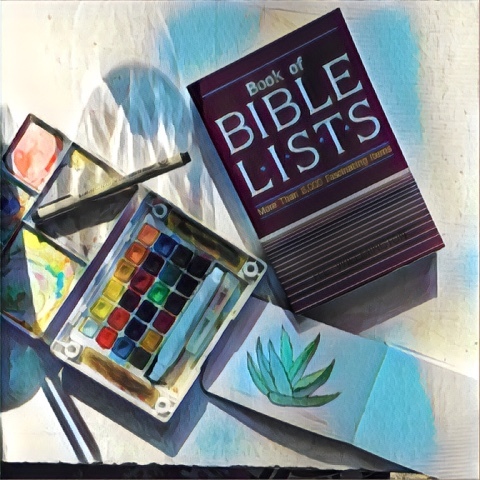 I absolutely love this book: "Book of Bible Lists: More Than 6,000 Fascinating Items" By H. L. Willmington. Goal: to choose a list and then illustrate every item. I am hoping to bring you along on this fun & informative journey! 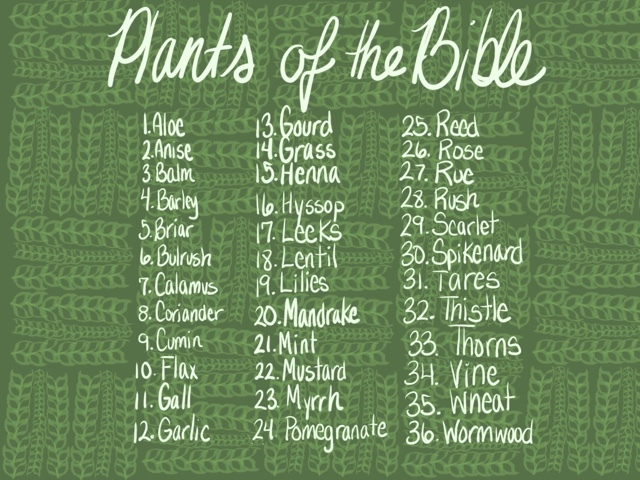 The list that I have chosen to start with is the list of plants found in the scripture.